Republican Sens. 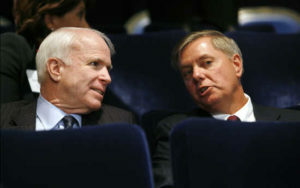 John McCain and Lindsey Graham released a joint statement accusing President Donald Trump of “hastily” issuing the executive order on immigration which the senators said would anger U.S. allies and hinder the war on terror. “Our government has a responsibility to defend our borders, but we must do so in a way that makes us safer and upholds all that is decent and exceptional about our nation. “It is clear from the confusion at our airports across the nation that President Trump’s executive order was not properly vetted. We are particularly concerned by reports that this order went into effect with little to no consultation with the Departments of State, Defense, Justice, and Homeland Security. “Such a hasty process risks harmful results. We should not stop green-card holders from returning to the country they call home. We should not stop those who have served as interpreters for our military and diplomats from seeking refuge in the country they risked their lives to help. And we should not turn our backs on those refugees who have been shown through extensive vetting to pose no demonstrable threat to our nation, and who have suffered unspeakable horrors, most of them women and children.